Martial artists are often considered some of the most highly skilled and best conditioned athletes in the world. Many maintain peak fitness and regularly undergo grueling training sessions. All attempt to practice and healthy lifestyles. Then there’s Joey Karate . . . If you’ve seen some of his act, then you know why I can’t post too much on this family-friendly blog. Let’s suffice to say his goal is to parody all the so-called “masters” whose authority is somewhat undermined by being overweight. We’ve all seen the swindlers whose bravado oversteps their skill and the effectiveness of their art. But would you call guys like Chuck Liddell and Georges St-Pierre fat and incapable in a fight? Let’s take a look. 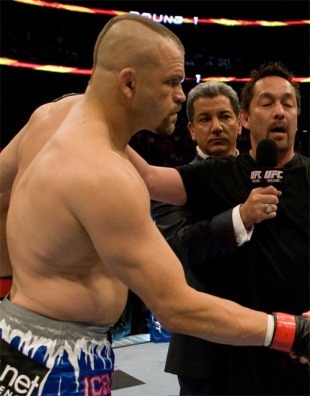 Here’s a shot of Liddell prowling the Octagon during the Ultimate Fighter. Presumably, he is looking for cookies. Who hid all the cookies? I bet it was Randy! In this picture Liddell is being sportsmanlike, but he also looks hungry. Not in the competitive sense, mind you. Georges is looking forward to the end of his training session so he can check out the new pastry shop in town. Which donut is best, Dunkin’ or zee Krispy Kreme? I will have to try them both! Did Georges just win his fight here? Obviously ice cream is in order! Ben and Jerry should name a flavor after me, no? How about Caramel “Rush”? Yeah, I just wrote a bunch of fat jokes about two of the most successful fighters in UFC history. Hopefully they won’t track me down and beat me up. But they’d have to catch me first, and clearly that would be difficult since they’re carrying so much extra weight. All kidding aside, there must be a reason why their bellies are bulging. Both Liddell and GSP are actually really lean, so why do they look so fat in these pictures? 1.) They both come from karate backgrounds. 2.) They both hit really, really hard. These two facts are interrelated. First off, as many a karate teacher will point out, you need to push the air down in your stomach when performing katas and kumites. This helps protect your internal organs in case you get slammed with a body blow or plowed into by a side kick. Ever get hit in the stomach when you’re not ready for it? Not fun. So after years of karate training–of pushing the stomach down and out to absorb attacks–both fighters have big bellies. Secondly, as any powerlifter will tell you, you need to push your belly out to generate power. Check out these pros. They vary in body composition, but they’re all shaped like barrels! I bet the one in the diaper can squat more than you! So, whether you’re lifting weights, running sprints, or working the heavy bag, you need power–and lots of it. Training in karate, especially with it’s traditional “one strike, one kill” philosophy helps you to develop powerful punches and kicks. You need a strong core and, consequently, a big belly to maximize your power output. Let’s take a look at Liddell and GSP in action. This pic shows Chuck just about ready to polish off Tito. See how his right hand is ready to club him? See how his belly is pushing out? It’s tense and ready to provide the torque he needs to through that famous overhand right. After I knock you out, Dad’s taking me to Friendly’s! It would be an understatement to say Georges St-Pierre well known for his kicks . . . It would be an understatement to say Georges St-Pierre well known for his kicks. How does he kick so hard? You guessed it. He uses his belly! How many times will we feature this image on this blog? In the interest of full disclosure, I was inspired to write this article because I might have put on a little sympathy weight during my wife’s pregnancy. (It’s not from all those burgers at summer cookouts, it’s from doing all that karate!) I haven’t exactly reached Roy Nelson proportions–maybe just a little more like Fedor. But neither of those guys have gone down from a body blow, and they could both punch a whole through a brick wall, so I guess I’m doing okay! 1.) Push air down into your stomach when anticipating an attack. 2.) Tense your stomach when striking to increase explosive power and torque. I’ll leave you with these tips to consider. If you have a few to share, please do. If you need me, I’ll be watching wistfully by the window for the last passing ice cream trucks of summer. This entry was posted in Fitness, Instruction, Karate, MMA and tagged Chuck Liddell, Fat Albert, fitness, George St-Pierre, karate, martial arts, Roy Nelson, Tony Karate, Ultimate Fighting Championship. Bookmark the permalink. 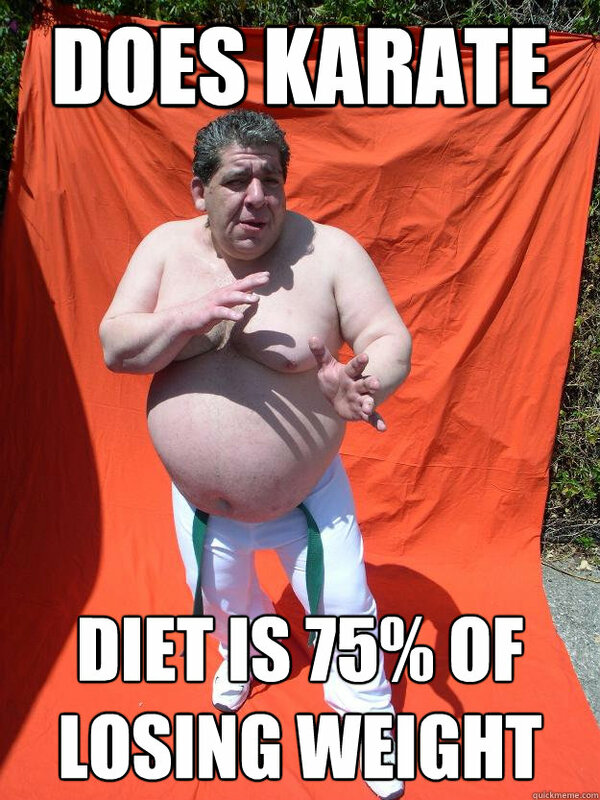 I would have bet the house that I would have been the first person to reference Joey Diaz on this blog. Sweet post! I’m only awesome when I’m wearing my green belt.